The Vema transform region viewed from the northeast. 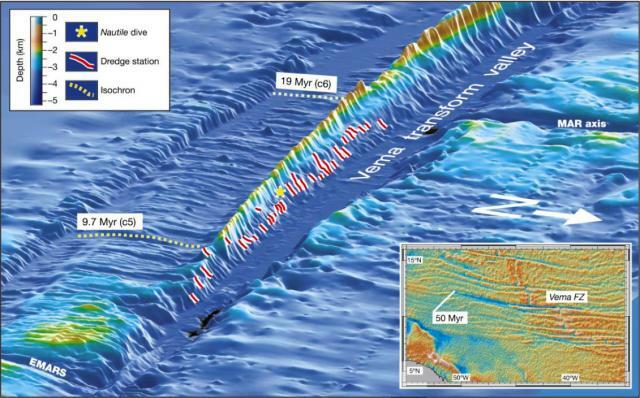 Figure is based on multibeam data obtained during cruises EW9305, and S-19 and S-22 (RV Akademik N. Strakhov). The Vema lithospheric section (VLS) is clearly visible. Location of magnetic chrons C5 and C6, of the Nautile submersible profiles, and of the rocks sampled along the VLS, are indicated. The inset shows a satellite-derived gravity image of the Central Atlantic, where the Vema fracture zone (FZ), the transverse ridge and the long-lived EMARS can be identified.